I’m a senior, and have home my own Pilates reformer machine. I absolutely agree with your statement that 'Pilates exercises can and should be modified for the older adult’. The book ‘Physiology of exercise and healthy aging’ by Taylor and Johnson lists on page 176 exercises potentially inappropriate for elderly. For example, the authors recommend that lying on back and lifting straight legs up, or sit-ups with feet/legs held could be substituted with curl-ups. These recommendations support your point. I assume when you say ‘ Pilates exercises ‘ you mean not only Pilates mat exercises but Pilates reformer exercises as well. It would be nice if you check inappropriate exercises listed in the above book , and made your recommendation about which Reformer exercise are inappropriate for elderly participants like me, and offer their substitutes. 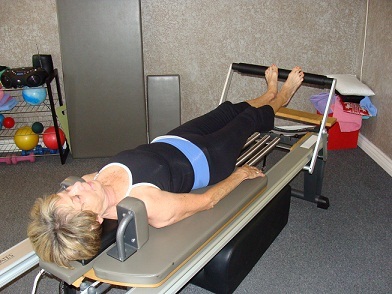 That's great that you are working on your own Reformer! The exercises they are referring to in the back are ultimately inappropriate at any age and can cause long term spine damage if done repetitively over time. The average age of my students is about 73 years old. At that age you can pretty much count on some type of degenerative spine condition, arthritis, osteoporosis, etc. 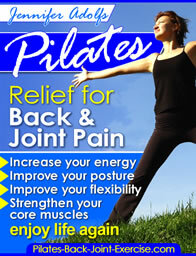 The contraindications for any of the Pilates work; mat, equipment, etc. is definitely no loaded flexion. This means no rolling on the spine, short spine on the reformer (taking the legs in straps up overhead for instance), heavy or deep flexion work forward using weight. Kneeling and wrist work (hands on the foot bar) should be as tolerated by each individual. Feet in straps, work as tolerated starting in a small range of motion. Sitting up side arm work along with mermaid, rowing forward and back. All of these done sitting in neutral spine. I use pillows and other props to make the student comfortable depending on neck, back, hip joint issues, etc. If something doesn't feel right or hurts, don't do it! And...find out all the proper modifications and progressions in my Pilates Ebook here.